Ok, so if you are going to have a string visible in your WPF application and your application can be in multiple languages, you are facing the localization problem. Do I localize or not? The answers are usually not now and I don’t know. So no localization work is done at first. Later, you wish you were more prepared for localization. Centralize your strings in a publicized Resources.resx file. Add a reference to your Properties. Replacing any statically entered text with the name of the string resource. Do you best to use dynamic sizing. If you are going to have a string in your WPF application, it is a good idea to store those strings in a centralized place for localization purposes. Usually in Visual Studio, that is in Resources.resx. Well, what if I told you that using Resources.resx is extremely easy? What if I told you that it hardly takes more time at all? If it easy and hardly time consuming at all, you would do it, right? I would. Hence this post. I have a project called LicenseAgreementManager. Right now this only needs to display a license agreement in English, but maybe someday, this will need to display a license agreement in any language. In Visual Studio, create a new WPF Applcation project. I named my project LicenseAgreementManager. Right away, you already have at least one string statically entered into your XAML, the text for the window title. Double-click on Resources.resx in your WPF Project. This found under the ProjectName | Properties option in your Solution Explorer tree. Change the Access Modifier drop down menu from Internal to Public. Enter your strings in the Resources.resx by giving them a unique name and a value of the desired string. A comment is also optional. You now have a publicized Resource.resx file and a few strings inside it. Add a line to reference your Properties in the Windows element. Change the Title attribute from static text to instead use access the string from your Resources.resx named EULA_Title. That was pretty easy, wasn’t it. 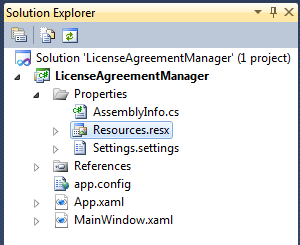 As you add elements that have strings, use the Resources.resx. As best as possible, remove any dynamic sizing. I have just added some items and removed the sizing as best as possible. Here is my XAML. What changes did I make above that I couldn’t do through the Visual Studio GUI? I removed Height and size from almost every element. I added SizeToContent=”WidthAndHeight” to the Windows element. I added some extra size to the margins. You don’t have to be localized to be prepared for easy localization. By doing the above simple steps, when it comes time to add localization, you will be ready. If you want to go on an finish localization. You might want to read some of my sources. Great tutorial! Useful tip is to use service like Get Localization http://www.getlocalization.com. Just upload your RESX file there and that’s it. Much easier for translators to work as it hides completely the complexity involved handling these files. Yeah…That is what I am talking about! As long as you are prepared for localization by having everything in your Resources.resx file, something like this makes localization easy.